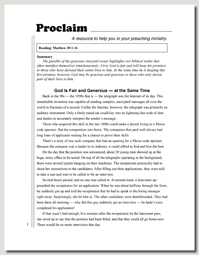 Subscribe To the PRINT EDITION of Proclaim Sermons! Get over the hump of writer’s block! Tailor each sermon with your own inspiration! Save more time for your other spiritual duties! Rather have the printed edition of Proclaim mailed to you? Each subscription includes 57 freshly written sermons per year sent to you two months in advance. Sermons are printed on high quality paper and three–hole punched. We mail you four months at a time. The upcoming year: April 2019 - March 2020. First installment ships immediately. May 2019 - March 2020. First installment ships immediately. To subscribe to the PRINT EDITION with a check or money order instead, click here.